¼ tsp Cayenne pepper or paprika. To desalt cod: place cod in large pot and cover with cold water. Let cod soak in refrigerator overnight. Up to 24 hours changing the water every 8 hours or so. Drain cod and shred into small pieces with fingers. Discard fish bones if any. In a big pot add shredded cod and peeled potatoes. Add enough water to cover cod and potatoes and cook until potatoes are done. Drain cod and potatoes add 1 beaten egg and remaining ingredients. Mix and mash. Place beaten egg into shallow bowl. Place the bread crumbs or flour into shallow bowl. Shape the mixture into small or medium flat (about 3/4 inch thick) patties. Coat the patties into egg and then coat with the bread crumbs or flour. Place 2 TBL oil in frying pan at medium heat. When oil is hot, add fish cakes and cook until light golden in colour. Cook for about 2 or 3 minutes. Fish cakes will quickly burn so keep a close eye. Once cooked place on plate lined with paper towels to absorb excessive oil. Serve hot or cold. Truly delicious! Note: Serve with a side veggie salad and lemon wedge. 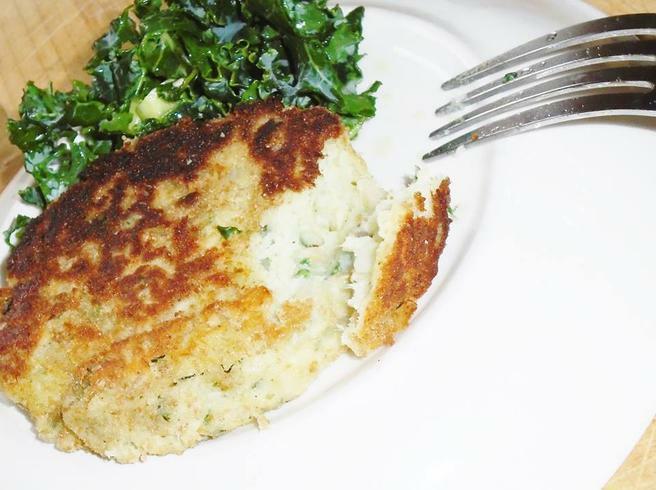 Non cooked fish cakes can be frozen to be cooked at a later date.